New York (AFP) - The NBA came down hard on Los Angeles Lakers forward Brandon Ingram Sunday, suspending him four games while banning teammate Rajon Rondo three games and Rockets guard Chris Paul two for their roles in a fourth-quarter melee. The league said in a statement that Ingram "has been suspended for aggressively returning to and escalating the altercation and throwing a punch in the direction of Paul, confronting a game official in a hostile manner, and instigating the overall incident by shoving Rockets guard James Harden. "Rondo has been suspended for instigating a physical altercation with, and spitting and throwing multiple punches at, Paul," the statement from executive vide president of basketball operations Kiki VanDeWeghe said. "Paul has been suspended for poking at and making contact with the face of Rondo, and throwing multiple punches at him." Paul was to begin serving his suspension on Sunday, when the Rockets played again at Staples Center against the Los Angeles Clippers. Ingram and Rondo will begin serving their suspensions on Monday, when the Lakers host the San Antonio Spurs. The fight erupted with 4:13 left to play and the Rockets leading 109-108. 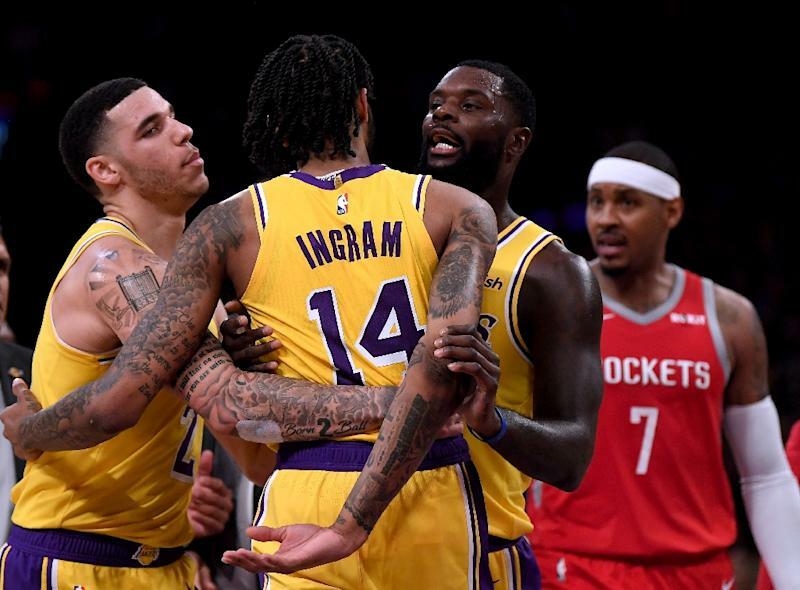 Ingram received two technical fouls - one for pushing Harden and the other for punching an unsuspecting Rockets player from behind as he charged back into the kerfuffle. Paul and Rondo also traded blows, Paul claiming that he had shaken his finger in Rondo's face after the Lakers player spit at him. The extraordinary scenes overshadowed LeBron James's home debut with the Lakers, which ended in a 124-115 Rockets victory.